Cinderella Moments: It's My Birthday! My sister made me this picture above. It's me working on a dollhouse chair sitting on a macaron. LOL! I'm also working on my new blog design. So things might look weird for a little bit. The "Un Immeuble a Paris" dollhouse is almost done! Have a very Happy Birthday, Caroline! Thank you so much for bringing so much beauty and fun into your happy follower's lives. Every post from you is like a gift, so for you today, all the best! Thank you SuzyMcQ! What a beautiful comment! You make me so happy! 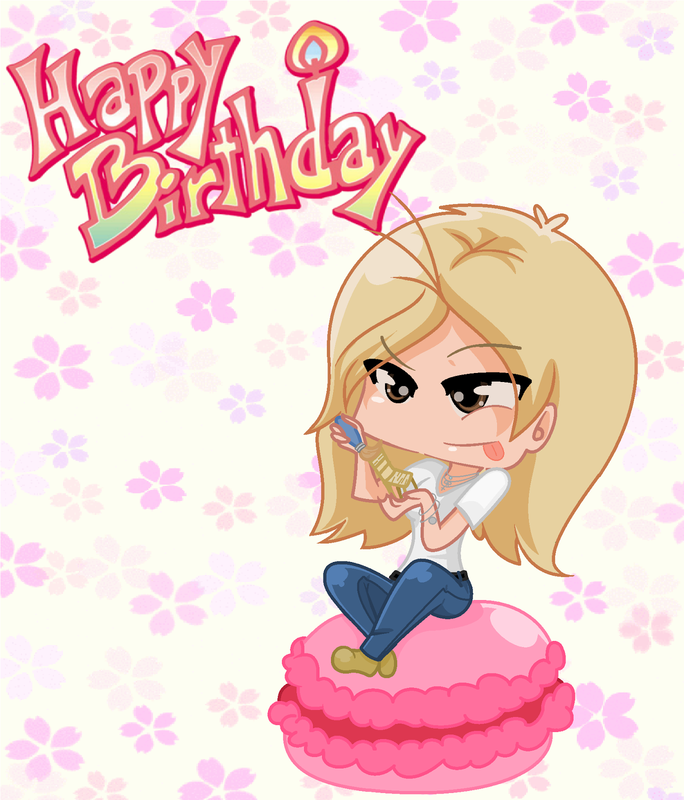 Happy Birthday, dear Caroline, I hope you'll have a wonderful day with lovely friends and wonderful (miniature) gifts :D! Your sister made you a pretty picture, but it doesn't do you justice, looking at your picture on this blog ;O! Wishing you a very Happy Birthday Caroline I hope you have a fantastic one. Muchísimas felicidades Caroline. Me encanta la imagen que ha diseñado tu hermana. Best wishes on this happy day! Happy Birthday Caroline! Hope your day is a special one! Happy Birthday, Caroline! Thank you for all your mini inspirations! How exciting!! This weekend offers some pretty awesome weather around here, hope you celebrate the whold time!! Thank you Barb! I had such a terrific day. And all the comments have been so sweet. Muchas felicidades,espero que tengas un año genial,lleno de momentos felices!!!!! La foto que te ha hecho tu hermana es genial!!!!! that is funny illustration !, I love it. Happy birthday, you meet many more and that we can share. I wish you a fantastic and fun day. Joyeux anniversaire ma très chère Caroline! I hope you had a gorgeous day with nice surprises. Great picture from your sister! I'm looking forward to seeing your French house. Ooops, I'm a day late but a very, very Happy Birthday to you sweet Caroline! Ik hoop dat je een dag hebt met leuke miniaturen, gegeven door leuke/lieve mensen. I hope you had a great Birthday, dear Caroline! Full of gifts and surprises... Cute pictufe from your sister. Van harte gefeliciteerd Caroline ik had een kaart voor je gemaakt maar weet niet hoe ik het kan versturen naar je . Happy Birthday Caroline! I see that your sister is also talented just like you. Cute card! Have fun. Ich wünsche dir nachträglich alles alles Gute zum Geburtstag mit ganz viel Liebe, Glück, Gesundheit, Zufriedenheit und ganz viel Energie für deine kommenden Projekte.